It’s no secret….I like things that sparkle. I like pretty things that catch my eye. So when I’m decorating my home, I try to give it those same touches. Decorating at Christmas time is no different. 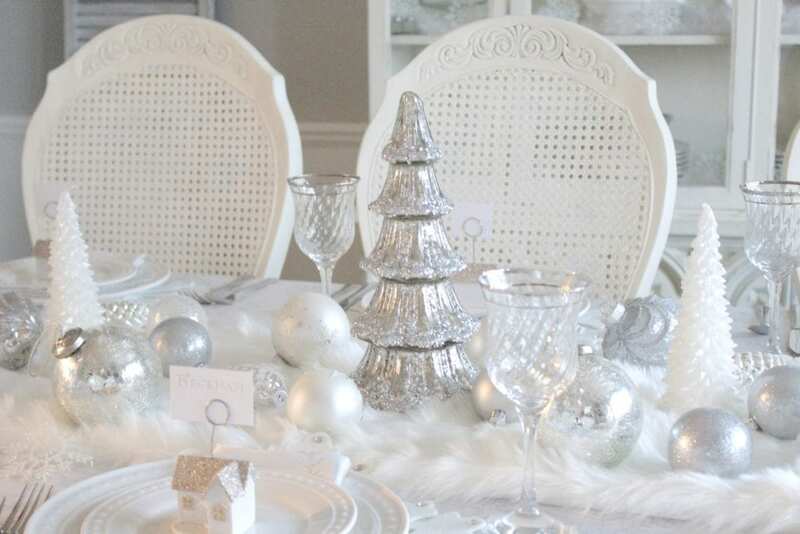 No matter what your color palette is or what theme you choose for your Christmas decor, you can still add that touch of glam. How you ask? I’ve gathered together some of my interior blogger friends that do that so well. 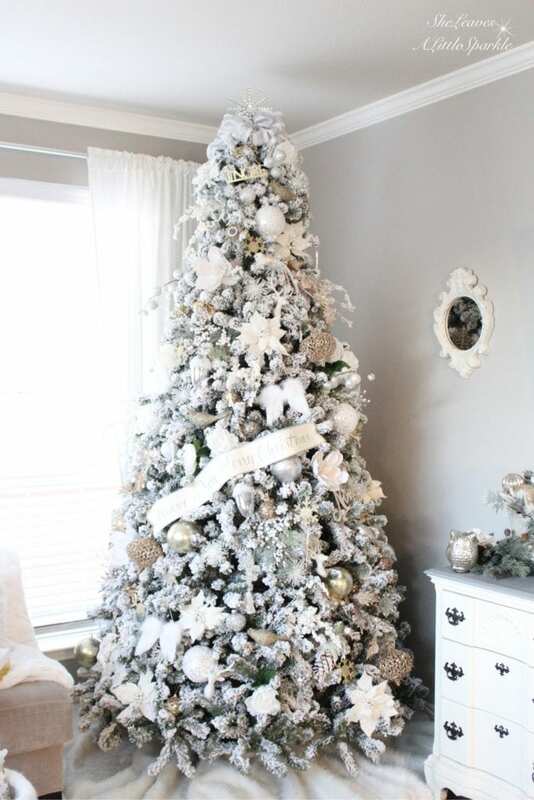 I have asked them to join me on a home tour today and share with all of you how we add glam to our Christmas decor. 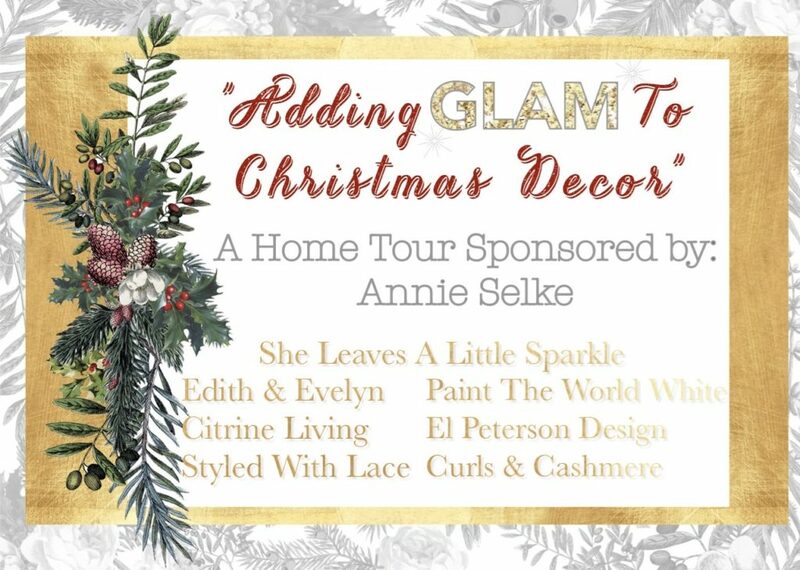 We’re so thrilled to partner up with our friends today at Annie Selke, who are sponsoring this tour and providing us hosts with some fabulous items for our home that we are sharing with you in todays’s post. We’re all so glad you’ve joined us today! Welcome back, to my regular readers, and a huge welcome to Brynne’s readers, if you have come over from Painting The World White. Wasn’t her home just fabulous?! 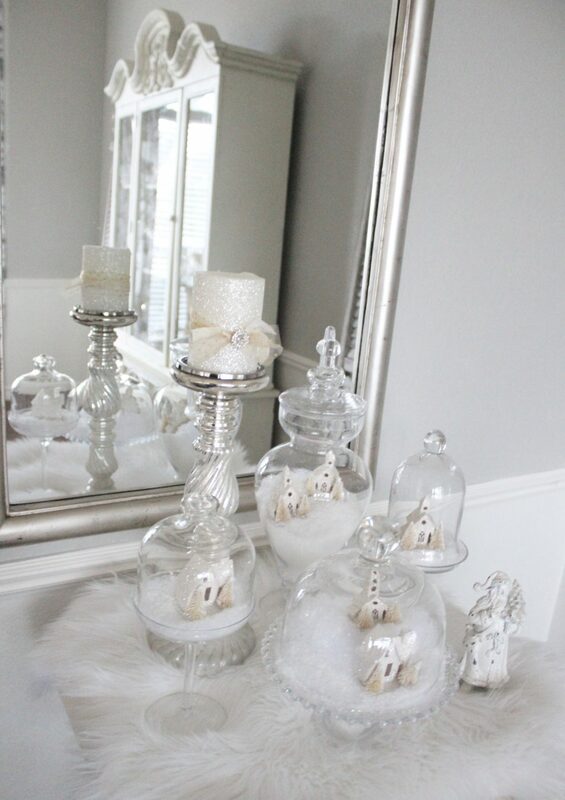 I love Brynne’s style and am always inspired by the different ways she decorates her home for each season. I hope you took note, or pinned all of her images and saved them for later. When I think of glam, I think of the old Hollywood actresses walking the red carpet with fur and bling and apparel made of fine silks and linens and velvets and metallic crepe dresses. Can’t you see them? Elizabeth Taylor, Lucille Ball, Marilyn Monroe, Grace Kelly, Audrey Hepburn….”The Glam Squad”. They knew how to glam it up. 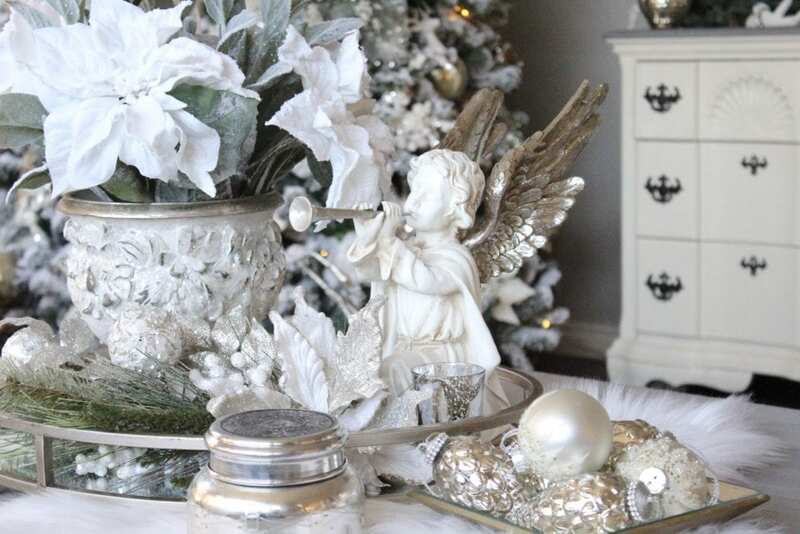 Now, let’s try to “glam up” your home this Christmas with some of those same things. 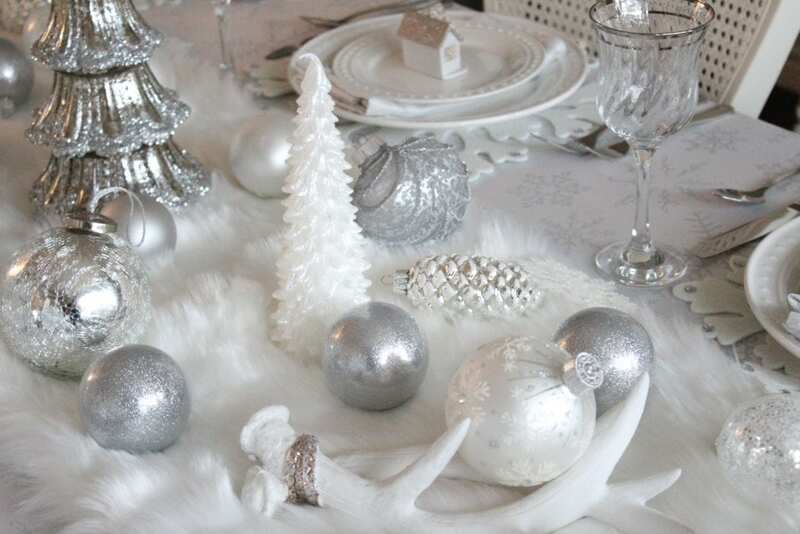 Think of using these pieces with these elements when adding glam to your home and Christmas decor: faux fur, mercury glass, glitter and sequins, glass and sparkly ornaments, rhinestones and pearls, feathers, shimmery materials and ribbons, and even a little bit of animal print. Mercury glass is such a perfect element that gives such a pretty “sparkle and shine” effect. 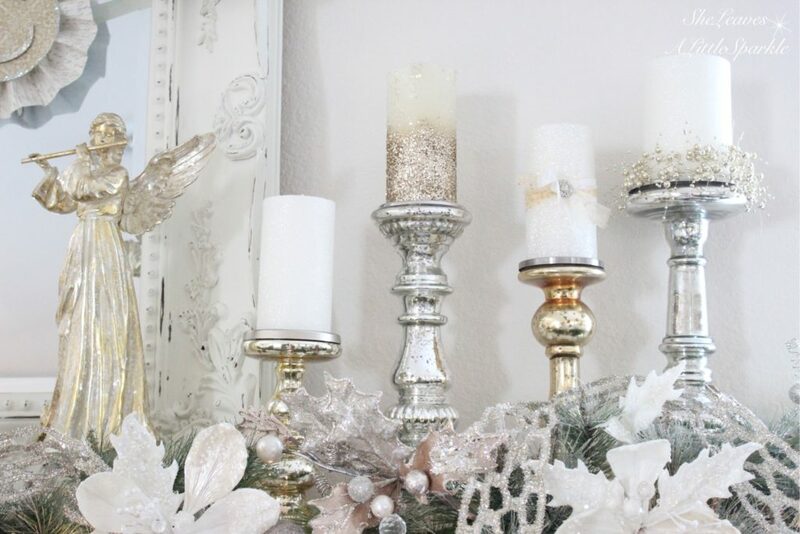 I used mercury glass candlesticks on my living room mantel. I adore this mercury glass compote bowl I found this summer. I’ve filled it with flowers in the past but this Christmas I found it to be the perfect piece to use and fill with sparkly ornaments. 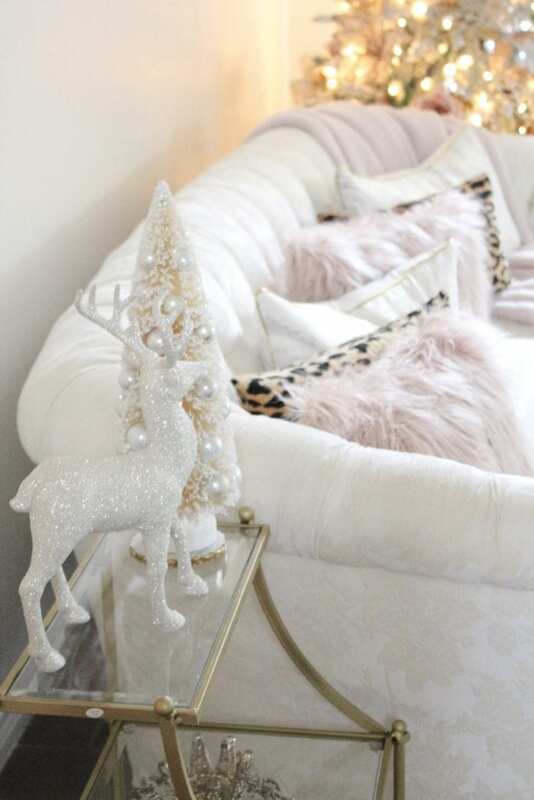 Fur rugs, throws or pillows also help you add glam touches to your christmas decor. I used faux fur material by the yard to create a tree skirt in my family room. I also added a fur piece underneath this tray when styling my Christmas Coffee Table. With a pretty mirrored tray and some beautiful sparkly Christmas pieces, it gives this rustic coffee table a glamorous feel. Especially with these pretty mercury glass pinecone and fancy white ball ornaments. 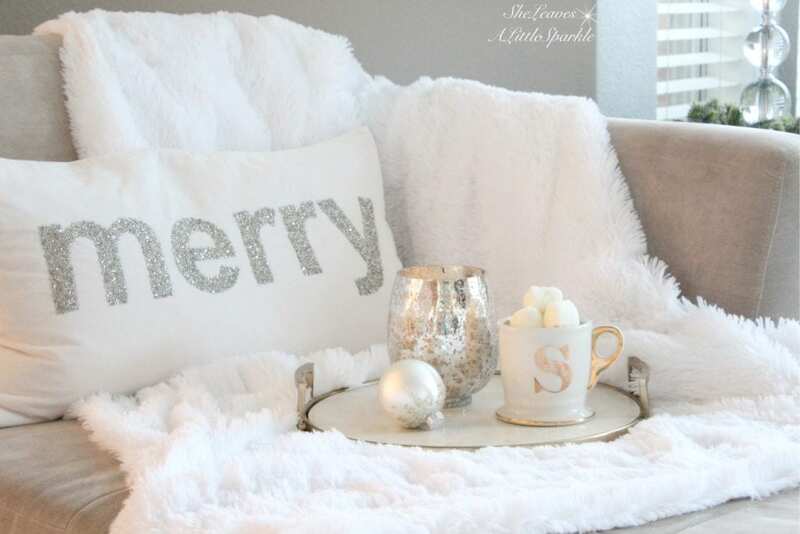 Faux fur throw blankets and sparkly pillows can take a casual room up a notch. In my Home For The Holidays Blog Tour last week, I shared this space in my family room where I did just that with this chaise lounge. You can even bring out your metallic mugs and pretty candles, like this mercury glass one I found at West Elm and smells of Christmas pine. I even added some Sparkly Marshmallows that I made. Oh yes, I did. And they are so so good (and easy to make). Come with me into my dining room. 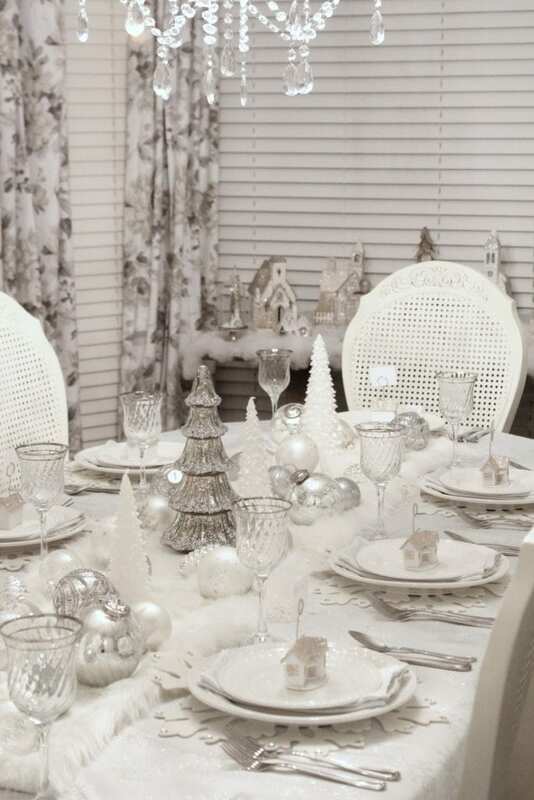 I’ve been saving this room to share on this particular tour because it’s my glam version of a “Winter Wonderland” tablescape. Starting with a shimmery snowflake tablecloth, I layered it with a fur runner, snowflake chargers adorned with gems, the matching shimmery snowflake cloth napkins, silverware, silver-trimmed stemware, and classic white dinnerware. Down the center of the table, I added different shiny ornaments and placed them on the fur runner. I used some lovely white tree candles covered in glitter and also this gorgeous mercury glass Christmas Tree. I had two of these pretty deer antler decor pieces that I used on each side of the runner, holding an ornament. 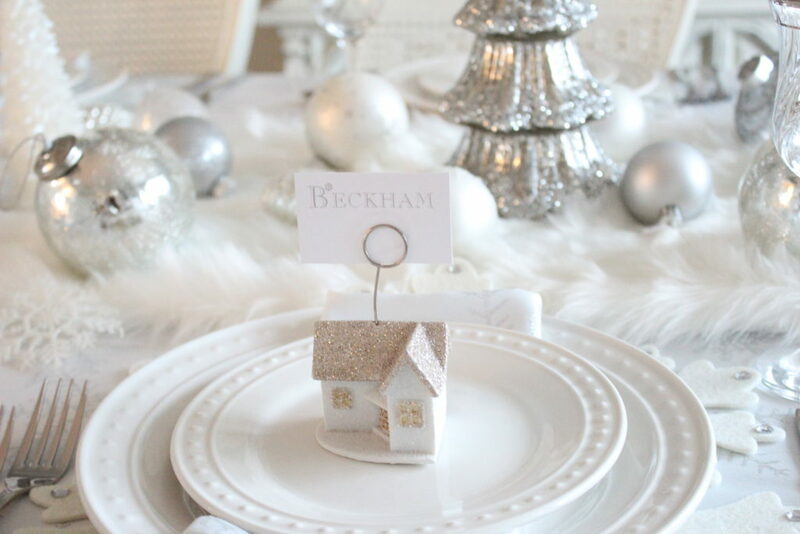 Last year, I purchased these adorable glitter house place card holders at Pottery Barn. I fell in love with them as soon as I saw them. They really tie everything in this room together. It’s like a village in here. One thing I decided to add (of course, at the end of photographing this room) were these gorgeous huge ribbon bows to each chair, embellished with a spray of flocked pine and a couple of ornaments. I love the way they just glam up this room a little more. One down, 7 to go! The sun was setting as I was taking these photos. I realized after sunset, that this lovely table had such a beautiful glow in the evening and was going to be so pretty for our dinner with our house guests that are arriving any minute to stay with us this week. I used the pretty Christmas polyfil that you see for sale this time of year, sprinkled with shimmery faux snow flakes. These little glitter houses are actually ornaments! I got them on clearance after last Christmas for 25 cents a piece and bought the rest of them. I just removed the ornament hook and turned them into a little village. 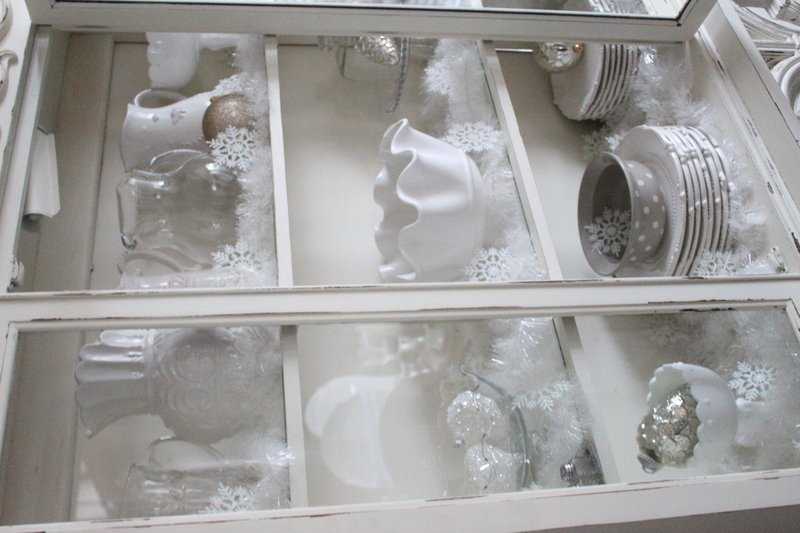 I found some “snowy” garland and placed it all around the shelves inside my china hutch. 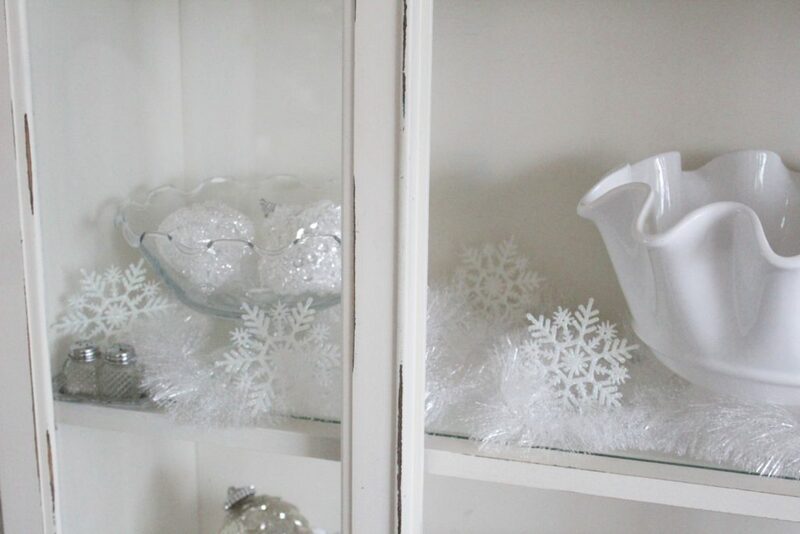 Using inexpensive snowflake ornaments, I just removed the string and placed them around the pieces inside. 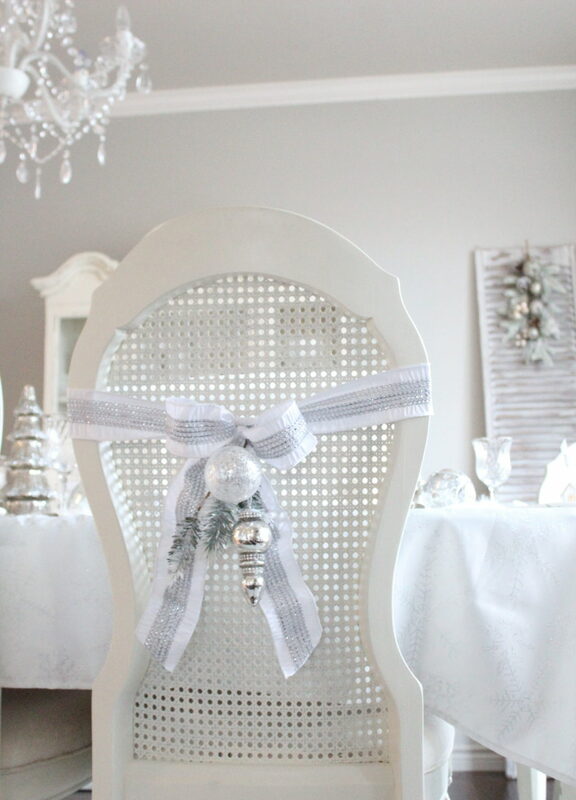 All the sparkle and shine and texture just dresses it up so much, don’t you think?! I threw in a few extra ornaments I had leftover as well. I’ve always wanted to have a little Christmas Village like my grandmothers both have (and had). It was always magical to me. So I started collecting a few pieces. 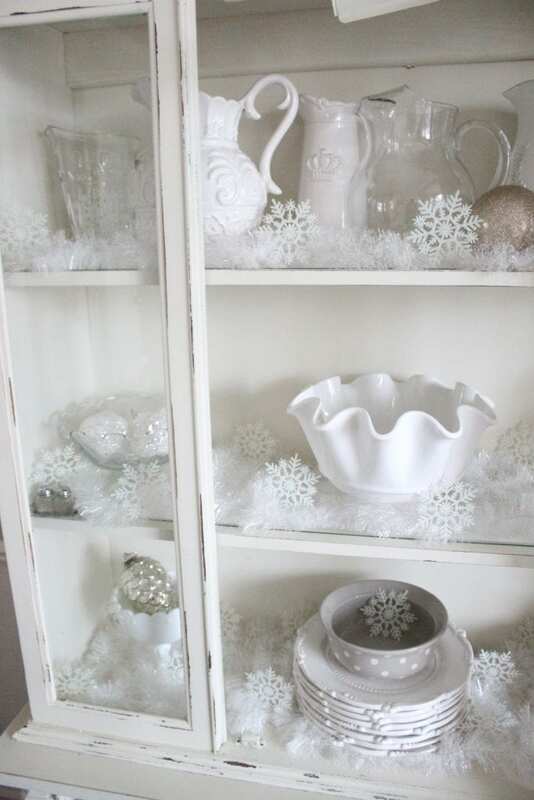 Using the same “faux snow” above, I placed everything on top of my buffet table at the end of the dining room and created my little Winter Wonderland there. I don’t love the blinds in the background BUT I do love the way the sun shines on all of the sparkly roofs and deer. It not only adds glam to this room, but it creates a magical feeling for me. Some of that is nostalgia, I’m sure. But anything sparkly is always magical, in a way, to me. I recently shared my Holiday Living Room Tour HERE and my new blush and gold Christmas tree. I showed all of the sparkle on my tree as well as the pretty blush rose stems and shimmery ribbon bows. 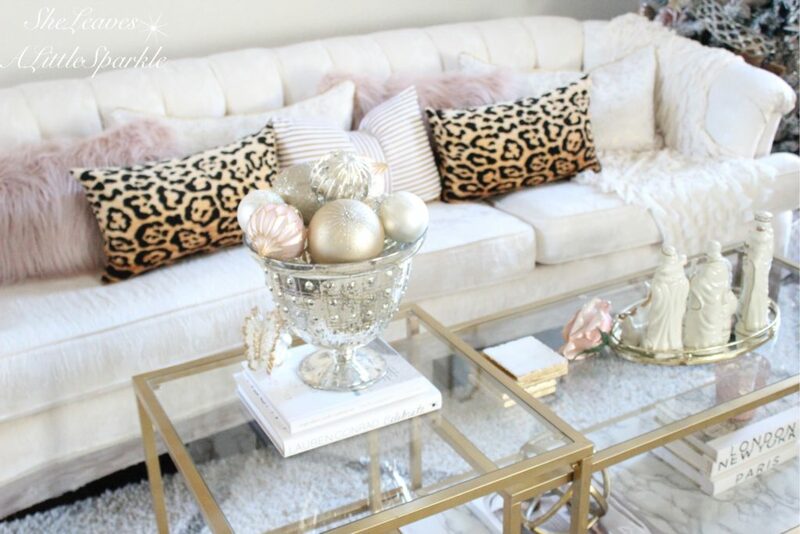 To add glam to the room, I incorporated a hint of leopard with a couple of leopard pillows against the soft blush and subtle metallic gold threads. Then to go a step further and give a little more glam to this room, I added 2 more things. 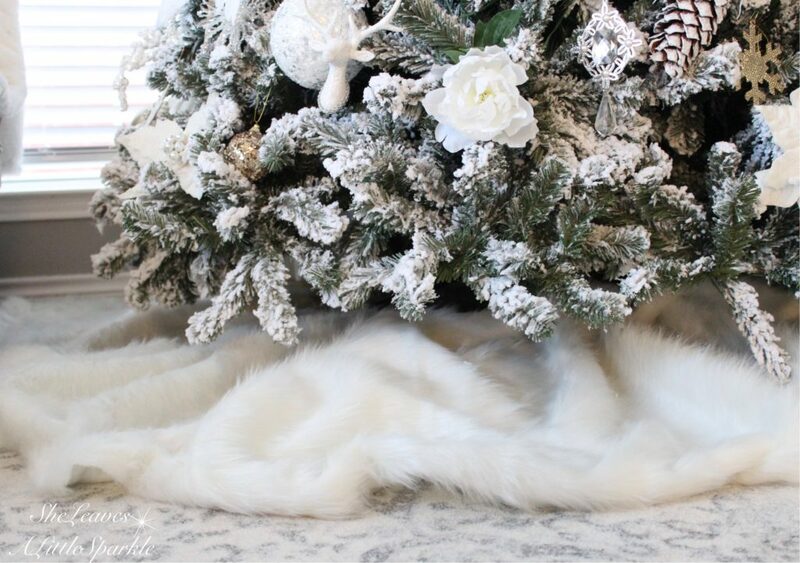 I grabbed a faux fur rug and placed it in front of the tree skirt and gifts. It was a great way to soften the area and give it a more cozy feel. When your friend walks in and says, “Oooooh I just looooove the fur rug you added right there,” you know you did the right thing. Cozy glam! 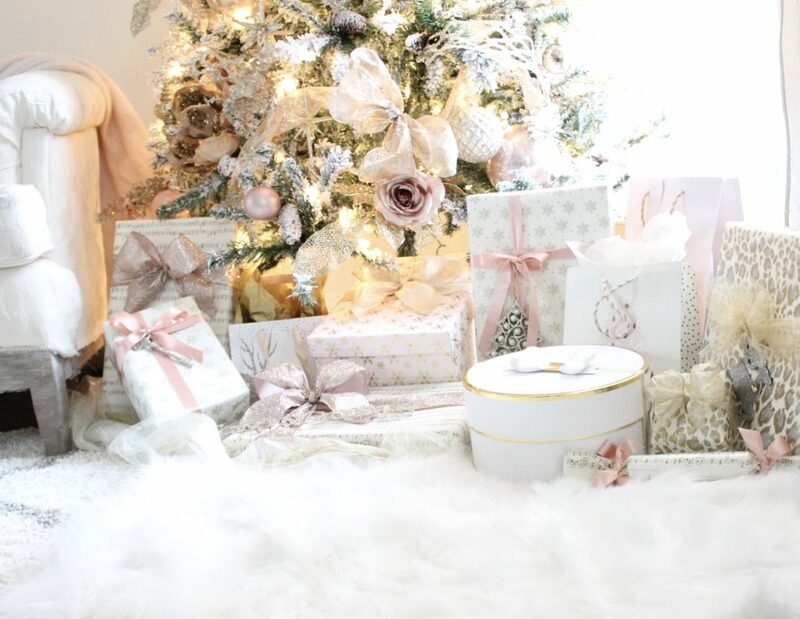 Don’t you just want to be sitting here in a pretty robe on Christmas morning, opening up those pretty packages? (another way to add glam…pretty packages) Yes please. I’ll feel like a million bucks! The second thing I did to add a little more glad to this pretty room was to add a fabulous throw blanket. Our friends at Annie Selke, who are sponsoring this tour, were kind enough to send me their new Pom Pom Slipper Pink Throw. It is absolutely luxurious! The wool-blend material is so cozy and soft while the blush pink gives it that romantic, feminine feel. The large pom-poms give it that fun look. It’s the perfect throw for this space. I could take one in every color, for every room in my home. It is divine! I love the way this throw just drapes along the side of this vintage sofa I purchased about 4 years ago (in mint condition, still covered in plastic from the 70’s…score!). I think I need to pull a Marilyn Monroe and go drape myself right over there with that throw blanket! 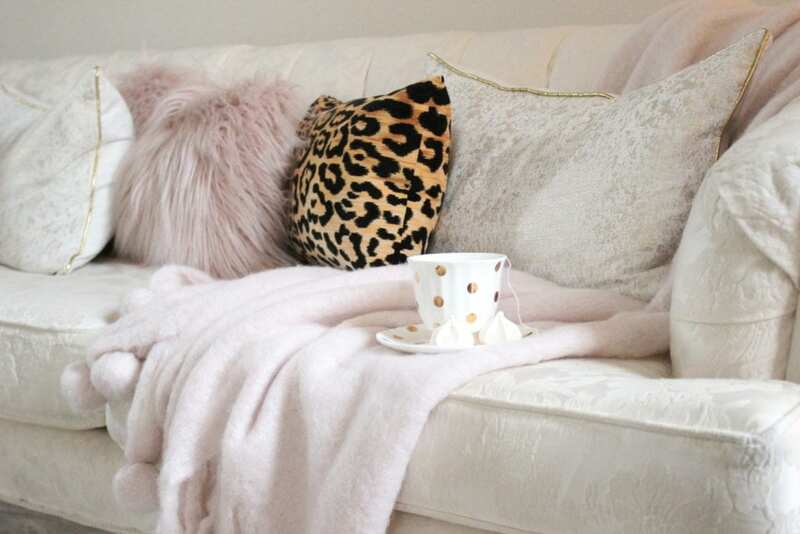 Do you see how the blush and leopard, with the combination of the faux fur and animal print give this space a more glamorous and luxurious feel? The pops of metallic gold add that much more. 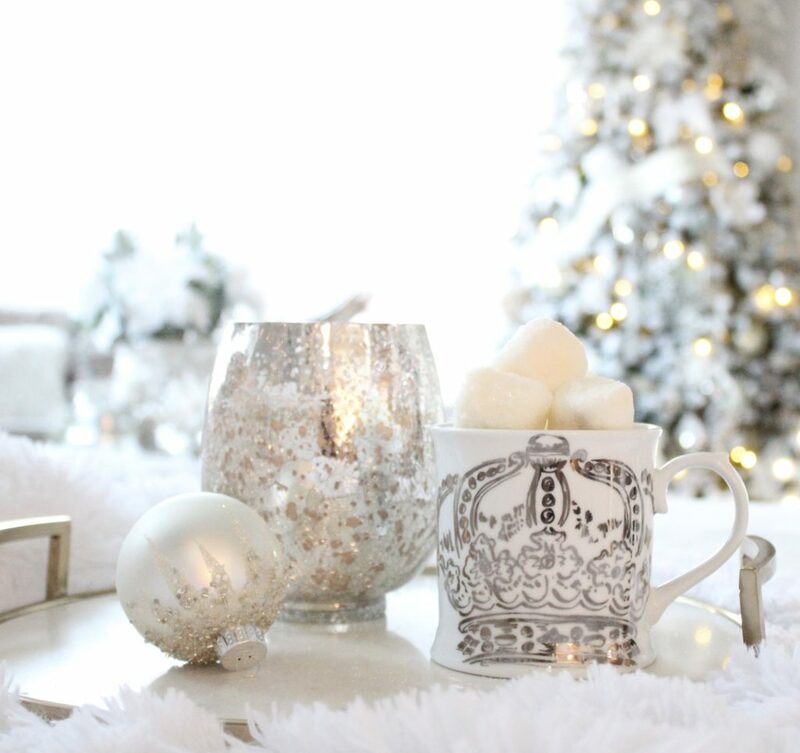 Also think about bringing out your prettiest mugs and tea cups this time of year. Whether they’re for your guest or to incorporate in your decor, they will definitely give a little sparkle and glam to any room or space. Using a few of these different elements together that I’ve mentioned, you can create such beautiful vignettes and get that feel that you’re looking for when you walk into a room. 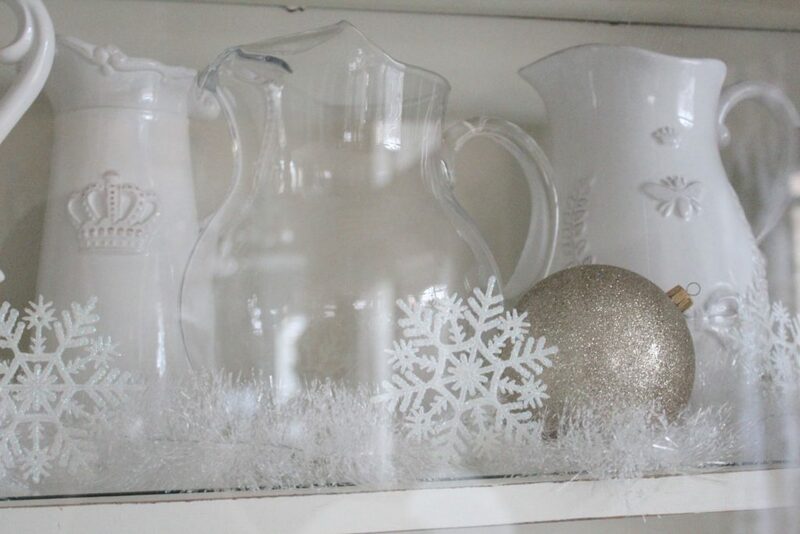 I hope you’ve enjoyed seeing the ways I enjoy adding glam to Christmas decor here in my home. Next stop on our tour….the fabulous Cindy at Edith & Evelyn. You are in for a treat because Cindy’s home is just so glamorous and elegant. Wishing you a very Merry Christmas and Happiest Holiday season! *Post contains affiliate links and is sponsored but all opinions are 100% my own. I only choose to work with companies and promote products that I love. What an amazing home tour! 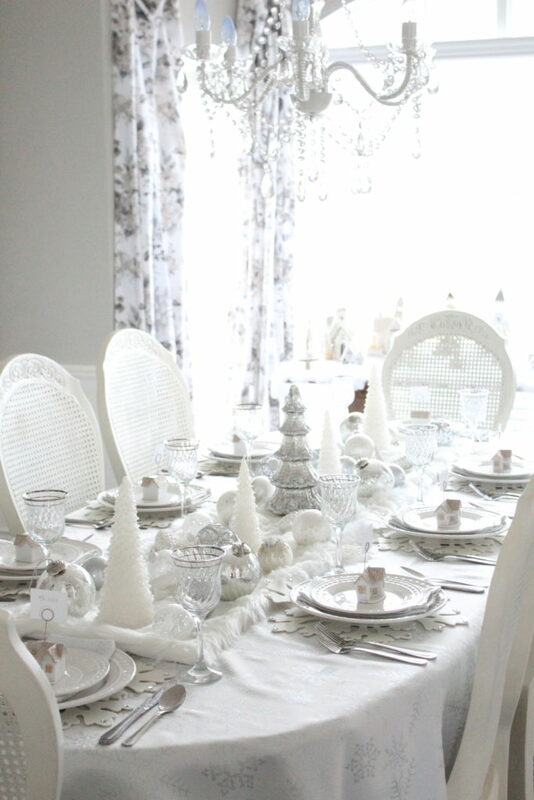 Every room is a feast with all of the glamorous details! Oh, I LOVE your home……my tree is pinks/golds and silver as well. How I would love that throw too……so perfect. If I hadn’t already spent my Christmas budget I’d also spring for a faux white furry rug! 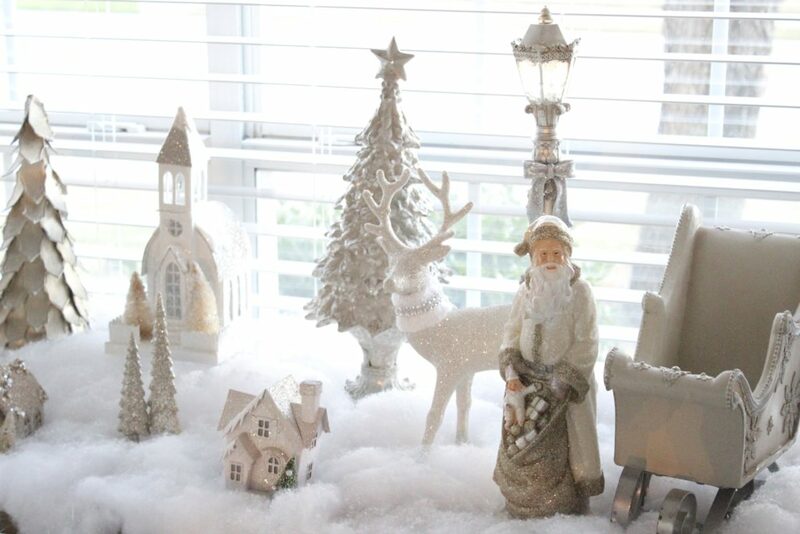 Your home is a winter wonderland….just beautiful! Oh my gosh, Summer!! I love it all! 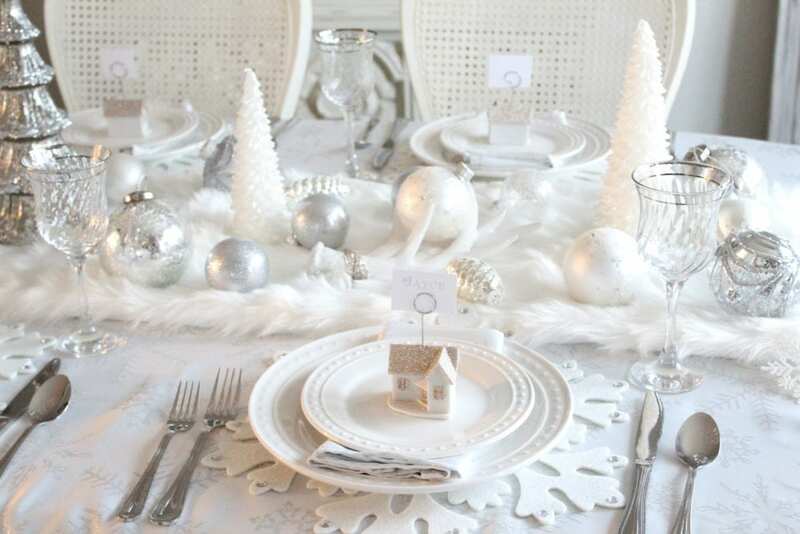 Especially your dining table with the cute little house place settings! I am dying over your leopard pillows. So bold but tie right in! And your use of mercury glass is second to none. Beautiful job, my friend!! Summer I think you do glam like no one does! I love every detail throughtout each space and it’s all perfectly true to your style which I absolutely love! I’m not sure which is my fav, but I love your village! I have a single one on my buffet and I think I need more so I can create the same idea next year! You certainly are inspiring! Thank you for inviting me to join this tour, it’s been so fun and I’m honored to be a part of it! 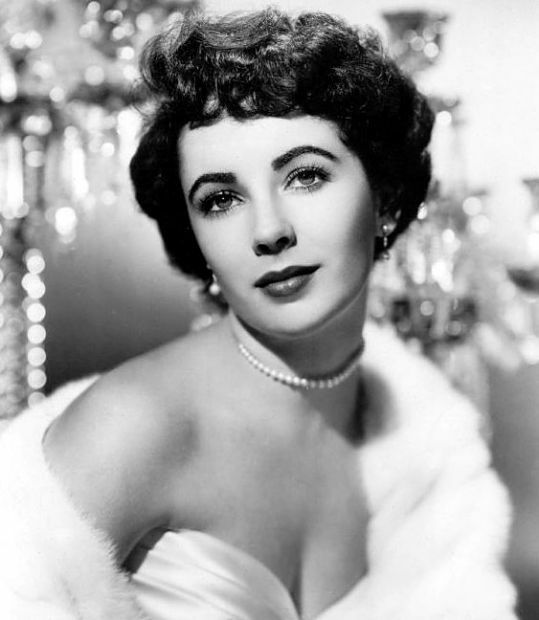 Summer, Elizabeth Taylor would indeed be clapping her hands at all of your glam touches!! Nobody does glam better then you and I love it all!! 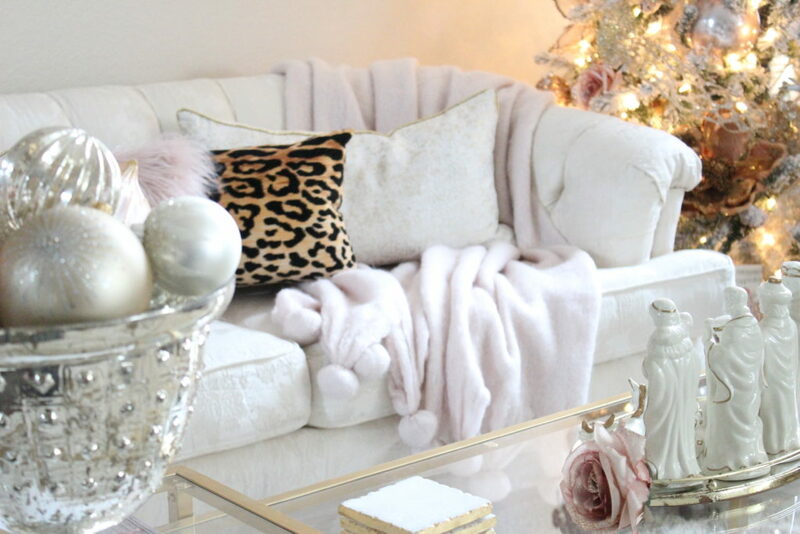 The blush pink fur mixed with leopard and sparkly glass is so chic and glam! 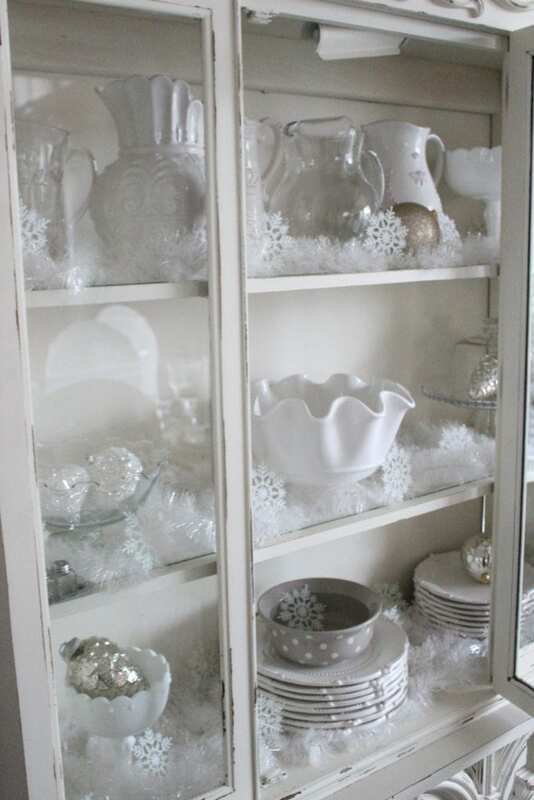 I adore your winter wonderland dining room with the snow village and thought it was so clever and pretty to add snow inside the china hutch! I could go on and on as every single thing was just stunning! Lacey and I are so thankful you invited us to join this fab group and fun hop! We really appreciate your support and friendship! You’re making me blush, Kim!!! Thank you so much my sweet friend. I always love collaborating with you. Loved your home. Merry Christmas! Summer!! It was amazing!! 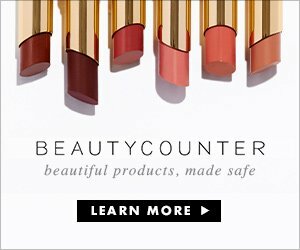 Loved your tips throughout the post! 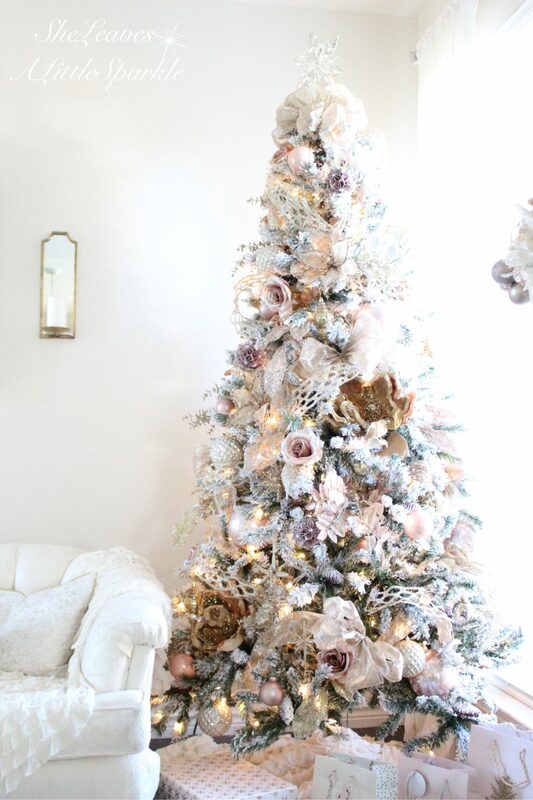 And the blush tree had me swooning! Thanks so much, Ashley!! So fun to do this with you… Merry Christmas! Anytime! So so glad you could join! Your home is perfection… Merry Christmas! You are the sweetest, always love doing stuff with you! Thanks so much my dear friend! You have inspired me to start a little Christmas Village. I loved all your great ideas. I can’t wait to start on mine. Thank you! What a fabulous tour of glam homes you put together. Glam is definitely my style so I throughly enjoyed looking through all of the homes. You definitely know your style and you do it well. Summer! Your home never disappoints! It is so calm and tranquil, yet sparkly and exciting! There is so much goodness to look at. 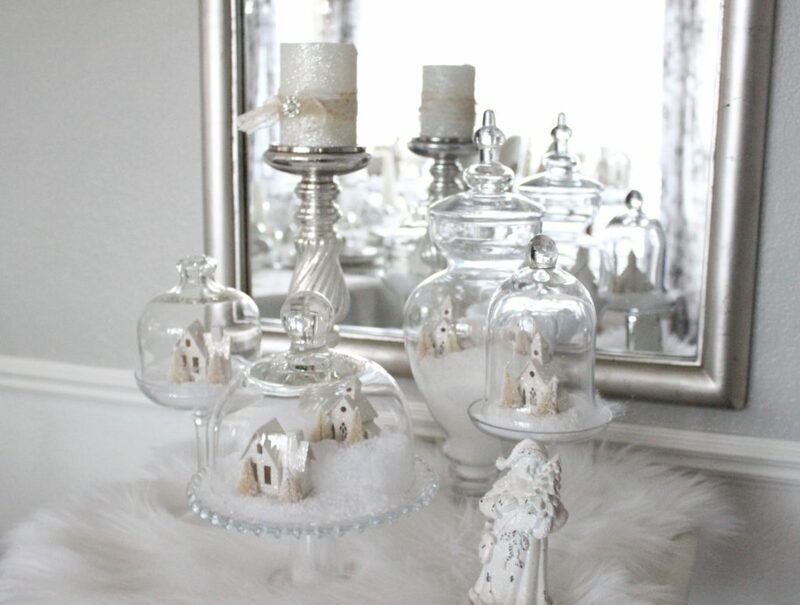 I love how you turned the Ornament houses into the most darling little vignette! Gorgeous! Summer, I totally loved reading this post & you nailed the glamour, as always, my friend! Your table is magical and your tree is beautiful!!! 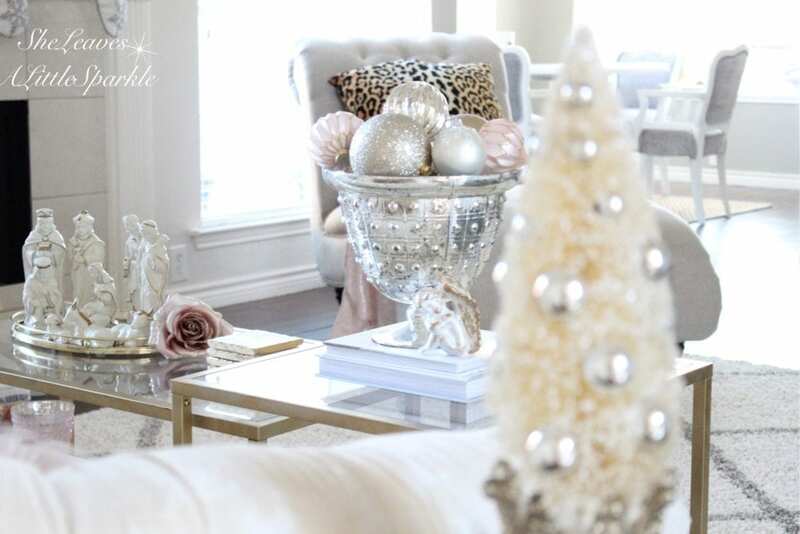 How can one not feel so glamorous when entering your gorgeous home for the Holidays! Yes, a home that the “Glam Squad” would definitely love. Glamorous and classic. Love the flocked tree! Every detail is truly exquisite….like a gorgeous strand of pearls! Merry Christmas to you and your family! So Sparkly and pretty. I have that same sleigh you have! I just love it. Was not sure what I was going to do with it but, then thought to myself…….I bet a wine bottle would fit and it did perfectly! Be sure and go see it on my blog! Merry Christmas!